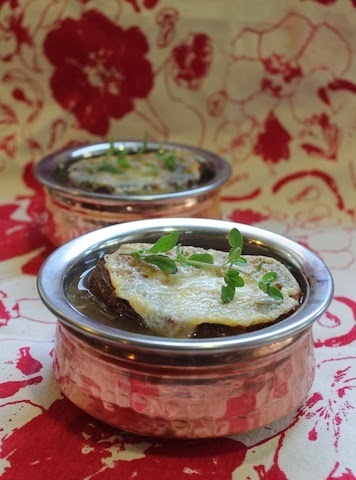 Hours of simmering make this delicious onion soup the perfect bowl of rich stock and silky onions. Topped with melty cheese toast, it will warm your heart as well as your belly. Today I am doing something a little bit different around here. I was invited by the adorable Tammi from Momma’s Meals to do a blogger exchange she calls Featured Friday. She chooses a dish from my site and I choose one from hers and we post the results together. It sounded like a lot of fun! 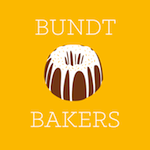 I’ve been reading Tammi’s blog for a while now and her friendly, casual writing style makes every recipe approachable. I especially love the letters she writes to her two sweet children. She’s honest about the challenges of motherhood while still clearly head over heels in love with them both. 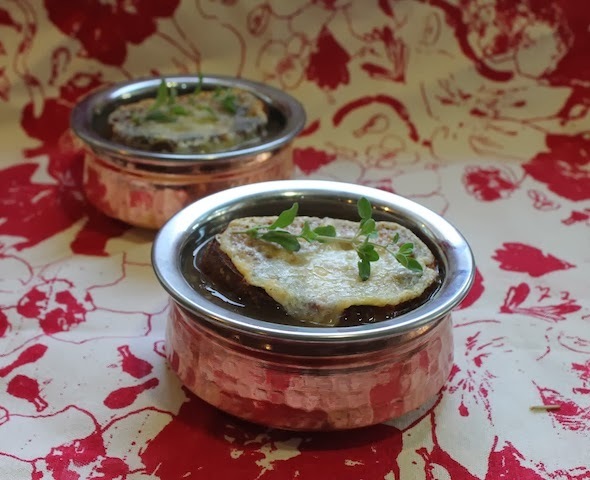 I chose to make her French onion soup because it’s still a little bit chilly in Dubai, and this soup is one of my favorites. I was almost tempted by her Baked Parmesan Pork Chops and her Honey-Roasted Carrots with Walnuts. Such lovely dishes. But I love a good crock pot recipe, so soup it was! I can't wait to see what she has chosen to make of mine! 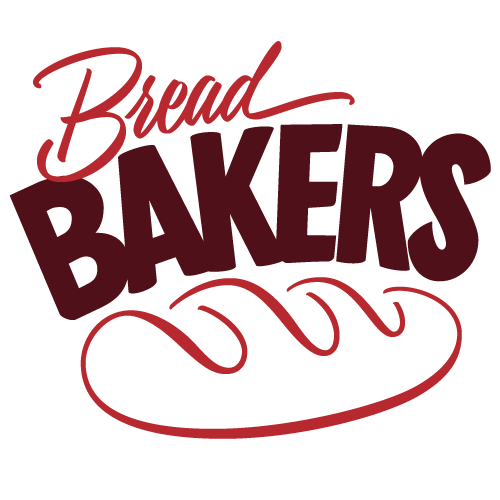 Bread – one slice per bowl. I used slices of baguette but any will do nicely. Cheese to cover each bread slice. (Pick your favorite, semi-hard to hard) I used a Tomme made from sheep’s milk. Peel then slice your onions and shallot very thinly. Mince the garlic. Turn the crock pot to high. Add onions, garlic, sugar, butter and balsamic vinegar. Cover, and let cook for at least one hour, stirring midway through. After that hour or so, sprinkle on the flour and give the whole thing a good stir. Add in the beer, stock, thyme and salt and pepper. Reduce heat to low and cook for eight hours. Prior to serving, put the broiler or grill on in your oven. Toast your bread slices in the toaster then top with slices of your chosen cheese. Put the toast on a piece of foil on a baking pan and pop it in the oven. Cook until the cheese is all bubbly and melted. When it’s almost ready, serve your portions out into bowls. 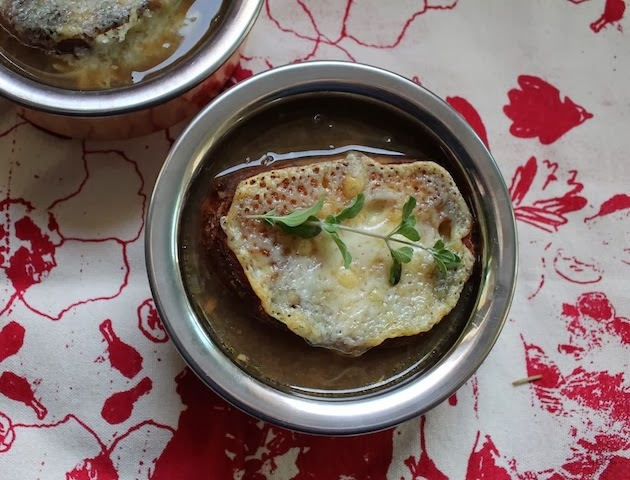 When the cheese toast is ready, lift the pieces off the foil, making sure to scrape up any cheese that melted over the side, and gently lay one on top of each bowl of soup. Garnish with more fresh thyme. Thanks again for choosing me for this week's Featured Friday, Tammi! It was such fun! 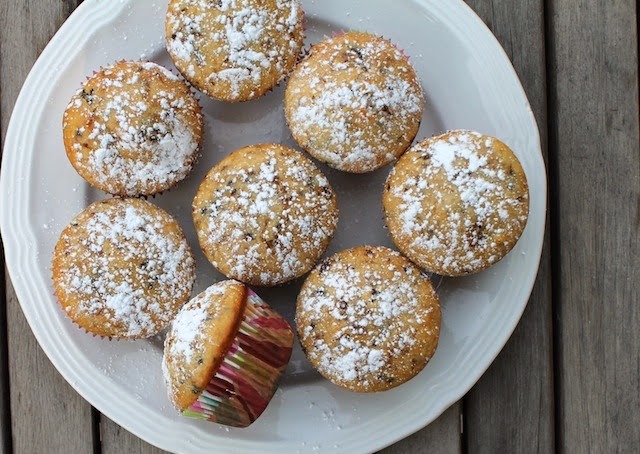 Creamy, thick sweetened condensed milk makes sugar unnecessary for these sweet muffins, while adding moisture and richness to the batter. These were inspired by the dark coffee sweetened with condensed milk that is served in many countries around the globe. Vietnam springs to mine as one of my favorites. During the years we lived in Southeast Asia, we took advantage of cheap fares and proximity to travel often to neighboring countries. 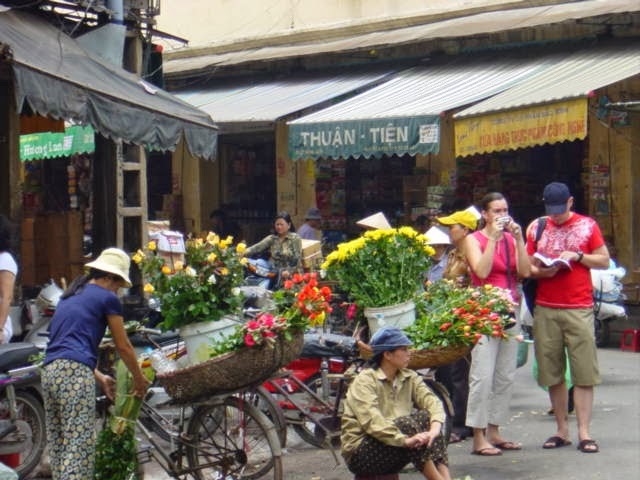 Vietnam was a favorite and we went there at least three times. 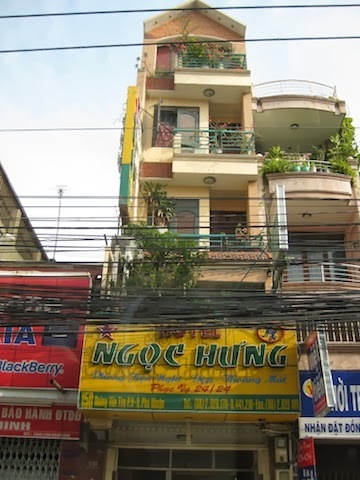 I’ll share a few of our photos from Saigon, Hanoi and Vung Tau at the bottom of this post, for those who might be interested. 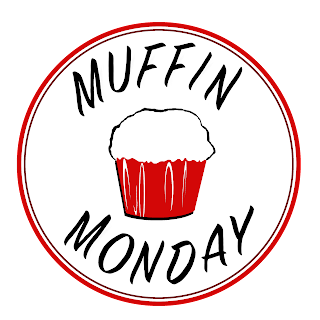 Preheat your oven to 350°F or 180°C and prepare your 12-cup muffin tin by lightly rubbing it with oil or use non-stick spray to coat or by lining it with paper liners. I ended up getting four extra muffins out of this batter because I decided not to fill the muffin cups too full. 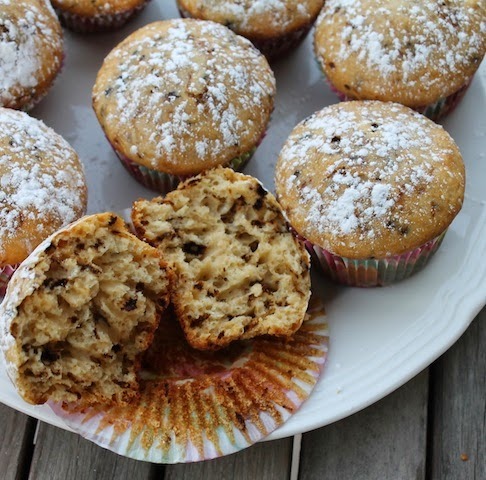 If you have an extra muffin pan, you can do the same. In a large mixing bowl, whisk together your flour, coffee powder, salt and baking powder. Whisk the condensed milk, oil, eggs and vanilla extract together in a smaller mixing bowl. 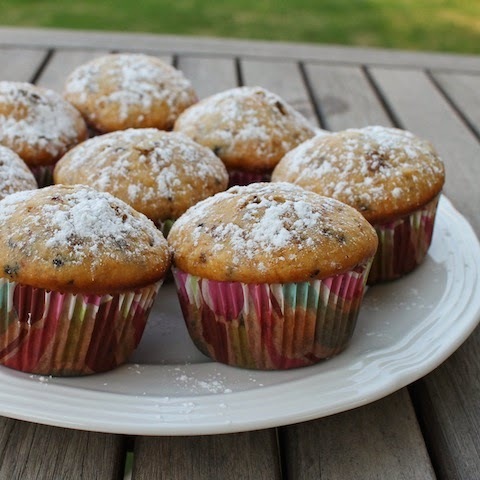 Bake in your preheated oven for about 20-25 minutes or until the muffins are golden and a toothpick inserted comes out clean. Sprinkle with powdered sugar, if using. If you’d like to enjoy a glass of Vietnamese coffee along with these, here’s a good link to instructions. 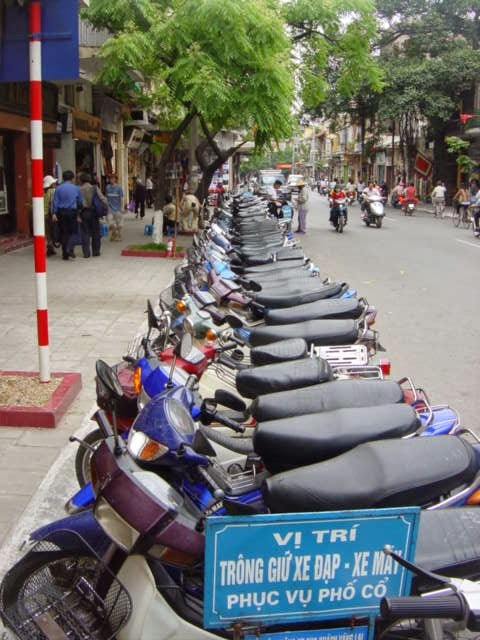 Here are some very random photos from our trips to Vietnam, with the disclaimer that I don’t always take the most touristy of photos. Struggling through the narrow, low Chu Chi Tunnels that were used by the Viet Cong during the war. I don't know the guy in front of me. 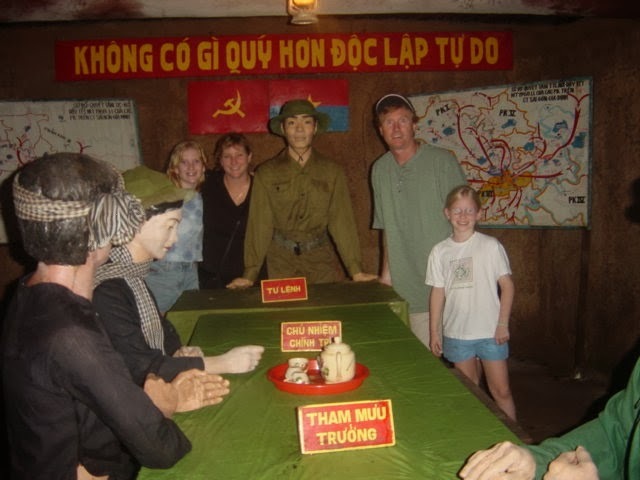 In an underground board room with mannequins posing as Viet Cong. Why we are smiling, I cannot tell you. 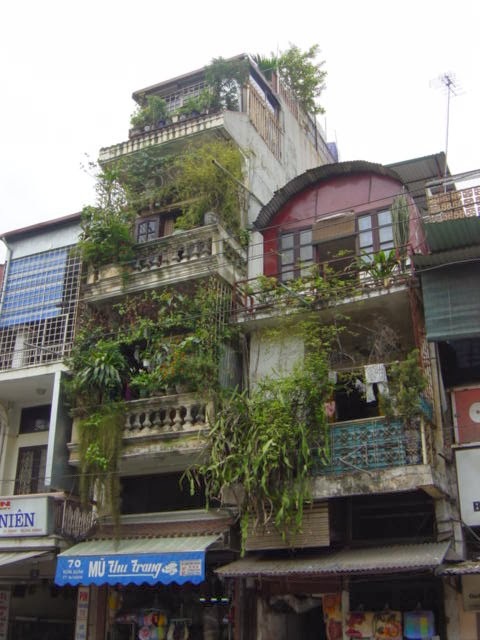 Many of the homes are tall and narrow. but these might well be for funerals. 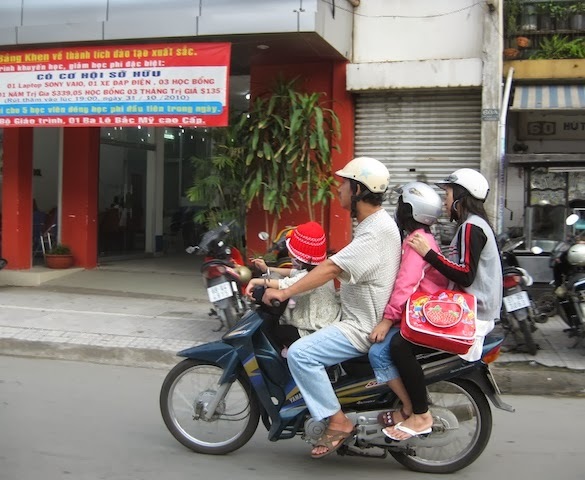 Anybody out there know the tradition in Vietnam? 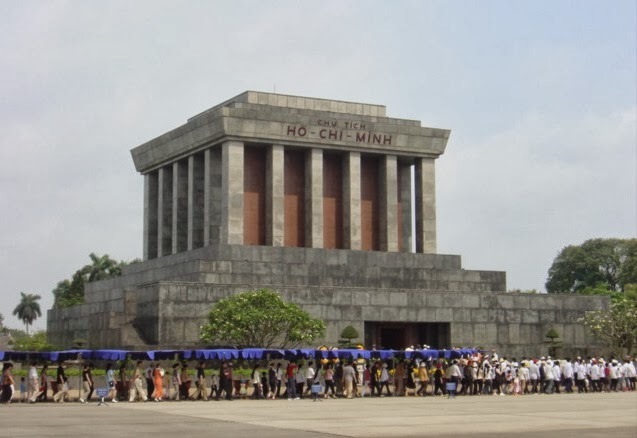 The tomb of Ho Chi Minh - It was a holiday that day so the queue to get in was enormous. 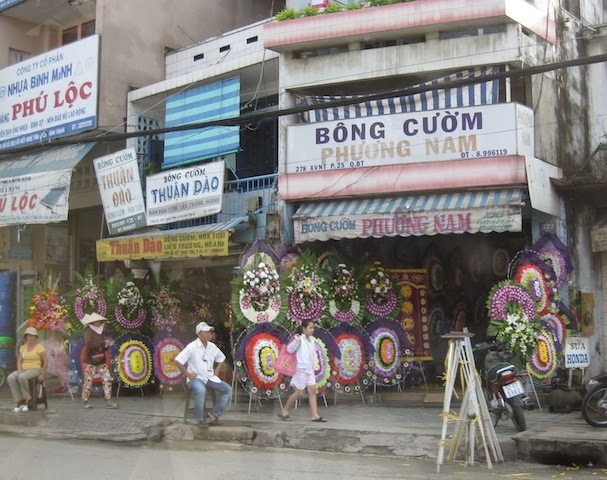 These are not tourists but mostly locals, there to pay respects. His body is on view, embalmed and preserved, despite his wishes. 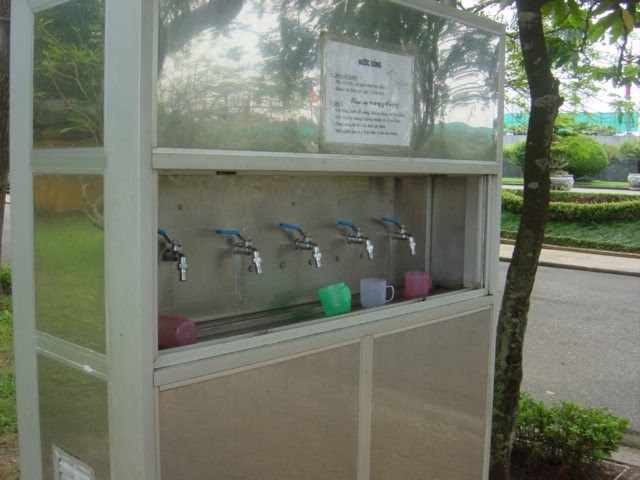 I took this photo because this is the communal water fountain, in the park outside Ho Chi Minh's childhood home. Still open for sharing at the height of the SARS epidemic, 2003. Everybody used those same plastic cups. More typical housing. I love the plants growing everywhere. 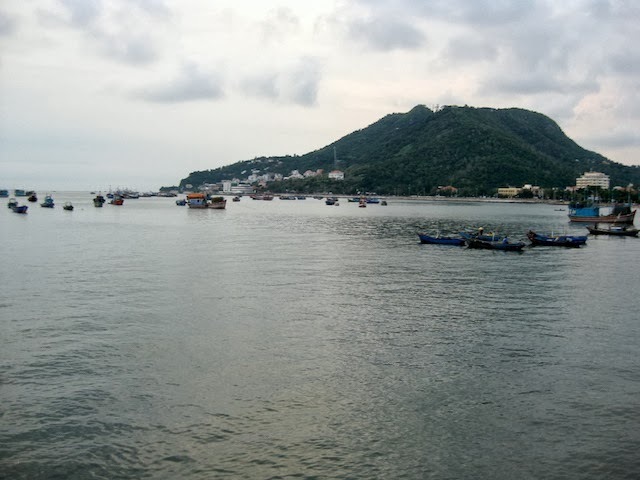 The bay in Vung Tau. And that's it for the tour! Thanks for stopping by! 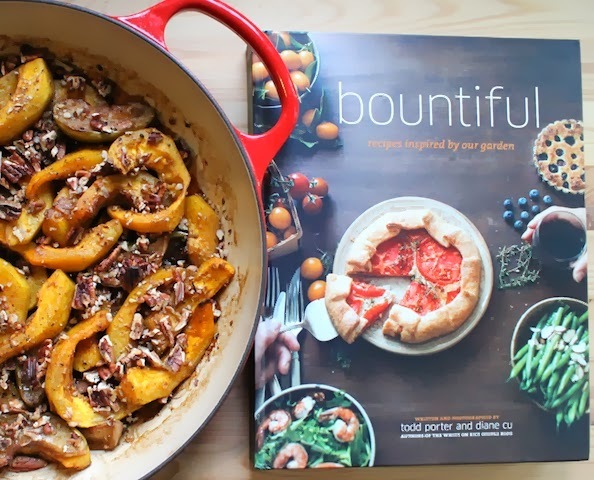 This wonderful recipe comes very slightly adapted from the gorgeous cookbook Bountiful – Recipes Inspired by our Garden, by Todd Porter and Diane Cu, the pair otherwise known as White on Rice Couple. If you don’t have this one already, buy it now. No kidding. While it’s not a completely vegetarian cookbook, it does showcase garden vegetables enhanced by fragrant fresh herbs and warm, wonderful spices, making them the rightful main attraction on any dinner table. 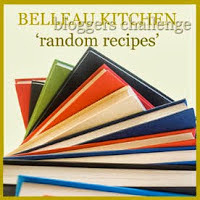 This month’s Random Recipe Challenge from Dom at Belleau Kitchen is to choose a new cookbook, perhaps one you got for Christmas and open it randomly to a recipe, then make that. As it happens, I got three cookbooks for Christmas, all from my mother, generous woman that she is. In addition to Bountiful, she gave me the latest Ottolenghi book, Jerusalem and Clotilde Dusoulier’s new vegetarian cookbook, The French Market Cookbook. I have spent the last few weeks reading and bookmarking and it’s going to take me ages to make all the dishes I want to make from all three fabulous books. I’ve already said, “Buy Bountiful.” But you’ll want the other two as well. Peel your pumpkin and remove the seeds. Slice into half moons about 1/2 in or 1cm wide. Set aside. If you want to toast the seeds later, these instructions are simple and easy to follow. Peel, halve and core your apples. Slice them into thick wedges. Choose an ovenproof saucepan and you will save the washing up. Otherwise, the first steps of cooking will be on the stove and then you will need to transfer the ingredients to a baking pan. Melt the butter in your pan over a medium heat. It will start to pop and sizzle as the milk liquids evaporate. When it stops sizzling, add in your brown sugar and your cinnamon and stir well until the sugar has melted into the butter. Add in the apples and stir well to coat them with the sugary butter. 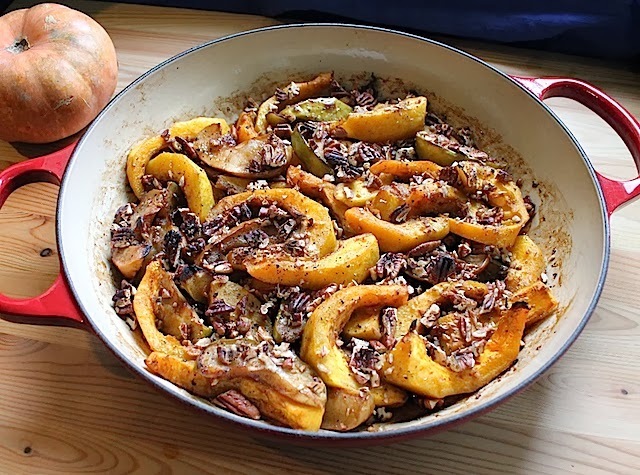 Sauté gently until the apples have softened slightly then add in the pumpkin. Stir well to coat the pumpkin with the butter and the apple juice that has cooked out the apples. Give the whole thing a good sprinkle of sea salt and a few good grinds of fresh black pepper. And then top with the chopped pecans. Pop your saucepan in your preheated oven (or transfer everything to an ovenproof baking pan) and roast until you can pierce the pumpkin easily with a fork. Mine took about 30-35 minutes. 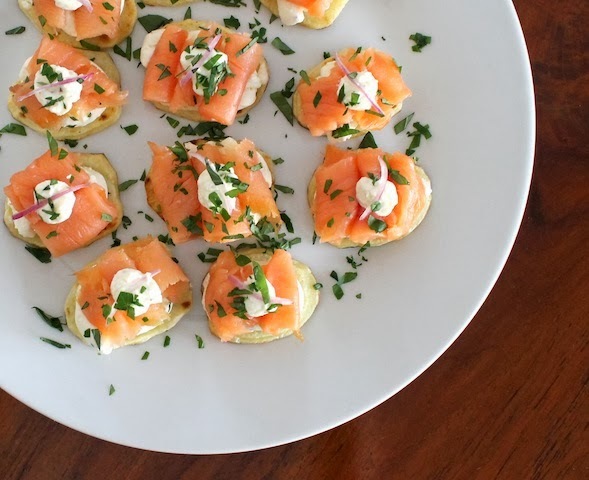 If you are looking for a change from crackers and bread as a base for canapés, may I suggest sliced potatoes? They work particularly well with cream cheese and smoked salmon. 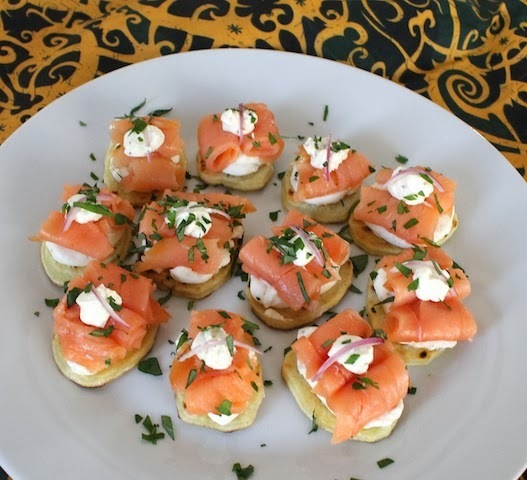 Check out my deliciously adorable smoked salmon potato stacks! It's a delicious combination. And naturally gluten-free. I have a confession to make. Sometimes I have neither crackers or bread. But I almost always have potatoes. Panfry a few thick slices and you've got the perfect base for the spread of your choice. I created this recipe a few years back for Appetizer Week. Since then I've served potato slices with many other toppings but you can't beat this classic combination. Quick to make ahead and quick to assemble, your party guests will love these easy to eat finger food. Peel your potatoes and slice them into rounds about 1/4 inch or 6mm thick. I got about 10 or 11 good slices from each potato and discarded the end bits, which would have been too small to match the rest. Drizzle a little olive oil on a non-stick griddle pan and cook your potatoes in batches until they are browned on both sides and cooked through. Set aside to cool. Mix the cream cheese, yogurt and lemon juice together in a small bowl and give it a generous few grinds of black pepper. Thinly slice your purple onion. Put the cream cheese mixture in a Ziploc bag and cut a small corner off so you can squeeze it out. Share the cream cheese mixture out between the cooked potato slices, reserving just a little bit to garnish. Cut the smoked salmon slices into skinnier pieces and roll them up. Set two or three small rolls on the cream cheese mixture. Finish with another small dab of the cream cheese mixture and top with a sliver of the purple onion. 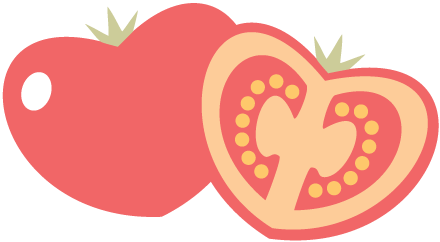 If you like onion and know your crowd does too, feel free to put more. Sprinkle with chopped parsley, mint or fennel fronds to decorate, if desired.